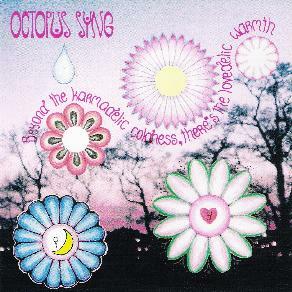 Octopus Syng - "Beyond The Karmadelic Coldness, There’s The Lovedelic Warmth"
This is the first full length CD by the one man project of Jaire from Finland called Octopus Syng. Jaire is clearly influenced by Syd Barrett and Daevid Allen but brings a lot of different influences into this happy psychedelic music! The CD opens with the sitar driven instrumental called We Could Be Everywhere. It’s So Nice To Feel High In The Summertime is a nice acoustic ballad. Jaire’s music just makes you feel happy. Life Of Nature is a really fantastic song with really cool guitar and vocal lines that mix together magically. Soft Velvet Dreams reminds me of Relics era Pink Floyd material. Chinese Dream is a short acoustic track with dreamy vocals. Frail Elephant is a funny happy upbeat psyche song with a really cool bass line. Wow... this is cool. Magical Moonlight And Mystic Girl is a bluesy psych song and I really enjoyed the guitar playing on this one. A Doors inspired track, perhaps? Spring is a solo piano track. All The Woods Of My Childhood is a 9 minute long track which Jaire takes us on a strange adventure. The CD ends with the sitar driven Varanasi Rock And roll All Night Long song. Fun and strange stuff. Brilliant CD! For more information you can visit the Octopus Syng web site at: http://www.octopus-syng.tk. Visit the Soundhawk Records web site at: http://www.soundhawkrecords.com.